Last August, the law that made the Winter Road an official route of the Jacobean Route came into force, great news that has not gone unnoticed by thousands of pilgrims and institutions such as the Association of Roads to Santiago by the Ribeira Sacra. Together with Correos, the association has promoted the initiative to create a special postmark, as well as a commemorative postcard and envelope on the Winter Road that can already be purchased at the post office in Monforte. The design of the commemorative postcard shows a map of the route of the Winter Road from Ponferrada to Santiago, marking some areas of special relevance as Las Médulas and the Ribeira Sacra and it has been put on sale 500 units; Unlike the previously edited edition, this one is already franked and therefore does not need stamp. As for the commemorative postmark, it will be available to the public at the post office of Monforte during the next ten days. 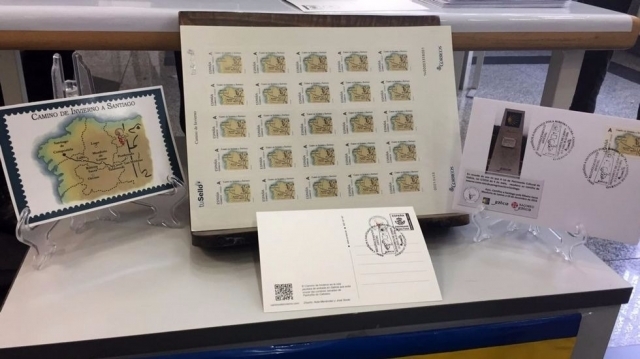 The presentation of the philatelic material took place this Saturday in the post office of Monforte, at the same time that an exhibition of stamps related to the Camino de Santiago was inaugurated, organized with the collaboration of philatelic society Miño Ourense and the school Sueiro.